October 2, 1959 saw the release of Guru Dutt’s Kaagaz ke Phool. The film was a total washout at the box-office and what’s more, received some scathing reviews in its time. Hailed as a masterpiece today, it is also remembered for being India’s first feature film to be shot on CinemaScope and released 50 years ago. Created by 20th Century Fox, CinemaScope was a lens series used to photograph widescreen movies and marked the beginning of the modern anamorphic format in both principal photography and movie projection. The first film released using this format was the epic The Robe starring Richard Burton, Victor Mature and Jean Simmons on 16th September, 1953 and proved to be a smash hit at the box-office. Following the success of How to Marry a Millionaire, released on November 5th the same year, Fox then licensed the process to other film studios. The representative of 20th Century Fox in India approached Guru Dutt and asked him if he’d like to make a film in the new format. Guru Dutt was naturally excited. The first tests were taken in his own garden as wife and well-known playback singer Geeta Dutt ‘modelled’ for him and cinematographer VK Murthy, sitting on a swing. The tests were found satisfactory and it was decided to go ahead with the format. 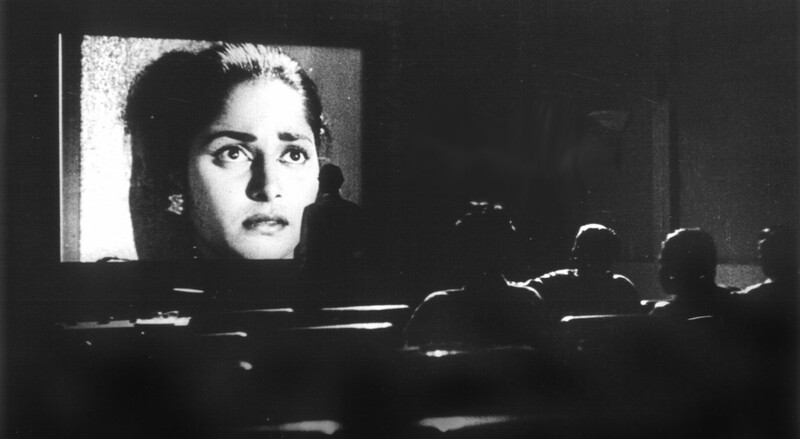 In hindsight, it is easy to see why Guru Dutt was the right director to make India’s first cinemascope film. He was one filmmaker who gave equal importance to the technical side of filmmaking along with the story and screenplay. To him, to try out something new was a challenge and a way of keeping up with newer cinematic techniques. Interestingly, Kaagaz ke Phool was not even meant to be India’s first CinemaScope film, Gouri was. Once he had obtained the necessary copyright licence from 20th Century Fox, Guru Dutt began Gouri to be made in Bengali and starring himself alongside Geeta Dutt. Some shooting was even done for the film around Calcutta and two songs were also recorded before Guru Dutt decided to abandon the project and embark on Kaagaz ke Phool instead. Even with the experience of Gouri behind him, the filming of Kaagaz ke Phool brought its own headaches. After viewing the rushes, Art Director MR Achareker brought to Guru Dutt’s notice the fact that the framings were suitable for the standard academy ratio not but not for the new format. Achareker then sat him down and taught Guru Dutt to conceive and compose the shots keeping CinemaScope in mind. Guru Dutt had to scrap all that was shot till then and re-shoot everything! Let’s be honest. I think Kaagaz ke Phool flopped on its release because it is an inconsistent film. In its better moments, it represents the best and most poetic work Guru Dutt has ever done. But it also suffers from a weak screenplay and it was the film’s overall morbid and pessimistic mood that caused audiences to reject it outright. Also, unlike his earlier films where the characters were well fleshed out, the family of the film director’s wife who want nothing to do with him are treated as cardboard caricatures while Johnny Walker’s comic angle appears to be forced in the film rather than integrated into it. Still, one cannot fault the film technically. The camerawork with its use of light and shadows is magical. Rarely has the Hindi screen seen better Black and White cinematography. Naturally, if anyone came out of the film unscathed, it was cameraman VK Murthy and of course, Acharekar, both of whom won Filmfare Awards for the film. @Ramchandra PN: Yeah everything changes doesn’t it? Over the shoulder shots for instance – work so well for academy ratio and quite a nightmare for scope! @Batul: I have certain reservations about the music as well. Normally, in a Guru Dutt film every song is great. Here, no doubt Dekhi Zamane ki Yaari and Waqt ne Kiya are outstanding but the rest – Ek Do Teen Char aur Panch, Hum Tum Jise Kehta Hai Shaadi, San San San Woh Chali Hawa and Ulte Seedhe Dao Lagayen are not bad but don’t match up anywhere to the other two. Yes, the film is gloomy. And I’d have to think several times before watching it today. But what bowls you is the music and the cinematography. I’ve often thought of what the marketing gurus would have said to Guru Dutt about ‘Kaagaz Ke Phool’? Absolutely right, Anil. In fact Kaifi Saab even mentioned that Waqt ne Kiya had no place in the film initially and the situation had to be specially created for it. Today, the film is unthinkable without it. The point I was really trying to make is that rather than being a misunderstood masterpiece that went over people’s heads as is the most common perception about the film, I feel the inconsistency in the script, the morbidity, pessimism and de-mystification of the glamour world is what did the film in. In its good parts, no doubt it is absolutely brilliant – just look at the creation of the 1930s type film studios and the delicate handling of the relationship between Waheeda and Guru Dutt – the protege and the director. And of course the picturisations of Dekhi Zamane ki Yaari and Waqt ne Kiya. Kaifi Azmi has said about this film that fundamentally it wasn’t very clear as to what Guru Dutt was trying to say and that’s the reason the auduences were left confused. According to Kaifi Azmi ‘Bichade sabhi bari bari’ is really the theme song of the film and it expressesthe film better than anything else. Yes, it is gloomy and when our Professor of Production showed it to us in the first month of our first term at FTII, we all wee very depressed and people really did not want to talk about it. It has brilliant passages though ! How I would have loved to meet that man. Lovely article, very interesting! both Saturday and Sunday Morning show) at Rialto Cinema, Amritsar. shot with camera on a crane and moving on 2+ axis. ‘Idiotic encounters’ song dance and race course scenes. screen film LEADER (1964) – CinemaScope print for a week engagement. that they got it back. PARDESI, PYAR KI PYAS, SON OF INDIA, LEADER plus ? ? ?